The 8 of you that are owed books we will be shipping in the next 7 days. As noted in emails with you guys owed books we have made it up with special DVD and CD gifts. We have been overwhelmed with personal issues along with our daily duties that that have put us weeks behind. We apologies many times over. Jokingly this book has become known as the curse around our house. It was delayed several times over the past two years. Anything and everything that could go wrong has, The past two years getting this to print were harder than the previous two decades. The ones who have read Don't Miss This!!! will tell you the book is well worth the wait. You will not find a more detailed history of East Tennessee Wrestling any where. You will follow wrestling in the Model City week by week from 1960-69. You will see the arenas across the territory. You will learn how much the wrestlers were making and how their pay was figured. We take a look at fact vs myth. Bios on many of the top stars of the day. Law suits, arrest and court records are shown. Many rare photos and anything else you would want to know about this areas Glory Days of Wrestling. 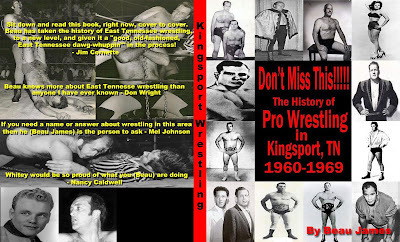 Now for NEW orders now through June 10 I will not only seen you the DVD The Legends of Kingsport with your book I will also send you the two CDs of Rare 70s Knoxville TV Audio featuring Ron and Don Wright, Jimmy Kent, Jim Lancaster, Lou Thesz, Steve Kovacs and more. Here is a preview of the CDs. I will have books with me in towns I'm wrestling at this summer. Also I will be doing a book signing and speech on Kingsport Wrestling History this summer in Kingsport. More about that to come so keep checking back here. Here is what Jim Cornette had to say about Don't Miss This!!! As the years go by, the sport of professional wrestling gets further and further away from it's roots, and goes more and more down the sad road of "sports entertainment". History is forgotten, bright stars are dimmed with the passage of time, and an entire generation grows up thinking that the silliness and tomfoolery they see on television is not only what wrestling is now, but what it's always been. That's unfortunate for a number of reasons, but it's especially disheartening for those of us who are old enough to have seen pro wrestling when it was popular in the mainstream instead of a cult following on the internet, taken and presented seriously, and produced and performed by people who made it their living and their life's work, instead of "corporate" types doing it for kicks, comedy writers looking to pad their resumes for a "real" job, and aspiring "actors and entertainers" who yearn for a career on the Broadway stage, or at the very least a cable reality show. That's why some of us, myself included, research the days gone by and write books about the sport's halcyon years in our hometowns, or home territories. The "big" promotions, of course, get the lion's share of the attention--there have been many books written about wrestling in the major cities in this country, and the promotions like the AWA, Mid-South, Crockett and the rest, but often-times the smaller promotions get short shrift. This is compounded by the fact that the passage of time takes away the legends, the movers and shakers of these areas that experienced it first hand. I'm happy to say that, at least in the case of East Tennessee, there's someone on the case. Beau James is a man after my own heart, in that not only is he the biggest fan of East Tennessee wrestling still breathing, but he's making sure that these stories don't die, that they are preserved for future generations of fans. It's especially important in the case of this book, which contains more information about the history of wrestling in the mountains of East Tennessee and it's environs than has ever been put in print, much less under the covers of a single book. I promise you, I've studied the business for over 40 years, and if I can say that I learned more about a territory from just one book than I already knew about it to begin with, it's a hellofa book. Such is the case with the one you now hold in your hands. The East Tennessee territory, by virtue of it's small population, it's isolation from major metropolitan areas, and it's particular quirks and customs, made it unlike any other wrestling area regardless of location or time period. It took a rare, and hardy breed to make it work and keep it going. Beau examines these men and their careers in a fascinating, and up close way, making liberal use of the newspaper records of the time as well as the recollections of many of the men who helped shape it. Here, you will learn about the promotional struggles, changes, and wars from the beginnings of wrestling in the area to the close of the territory days--bios of the promoters and top stars--the unique stipulation matches that were invented or popularized there--the lives and intertwined careers of the two men whose names became synonymous with wrestling for several generations, Ron Wright and Whitey Caldwell--even, for the first time ever in print, the story of Wright's famous "chisel", with pictures! And, for anyone that wants to win a bet easily, you can find proof that one of the men who main evented wrestling shows in Kingsport was the Japanese icon himself, Antonio Inoki. Sit down and read this book, right now, cover to cover. Beau James has taken the history of East Tennessee wrestling to a new level, and given it a "good, old-fashioned, East Tennessee dawg-whuppin'" in the process!